Edla Dark-Heart is a Nord assassin living with her husband Regner in Bruma. 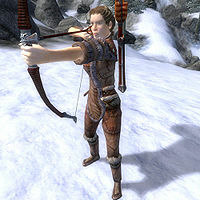 She is an basic trainer in Marksman and is rumored to have fled from the law in Skyrim. On normal weekdays (Morndas to Fredas), she wakes up at 6am, then spends the entire day wandering in her house, although she ventures downtown at three different occasions; at 9am she heads up to Nord Winds for a bit of browsing, and at 3pm she visits Fjotreid in his weaponry store Hammer and Axe. At 6pm she enters the Jerall View Inn for dinner. She returns back home at 8pm and stays there until she goes to bed at midnight. During the weekends, Edla starts out normally at 6am and even visits Nord Winds at 9am as usual; at 10am, however, she breaks off her usual routine and leaves town for a bit of hunting in the snowy countryside northeast of Wildeye Stables. If she finds a target, she will shoot at it and make sure to claim the arrow afterwards, which can cause a series of bugs, affecting her routine, her service times and her preference for targets (see the bugs section). Depending on events during the day, she returns to Bruma between 6pm and midnight and resumes her usual routine. On weekdays, she offers services when not sleeping or eating; during weekends, she offers services from she wakes up until she leaves Bruma, while only randomly offering them in the wilderness. When she returns, she will provide training as usual. Edla is armed with a steel bow and some steel arrows, a fur cuirass, and fur greaves. Her clothing consists of huntsman leather pants, oiled linen shoes, and an olive vest. She carries the house key and a small sum of gold. When you meet her for the first time she will introduce herself and her services: "Edla. Edla Dark-Heart. If you want to be a Marksman, I can train you. If you can breathe, I can teach you." When asked about snowy Bruma, Edla will tell you about her hateful husband: "One place is pretty much like another. Regner hates it, but Regner hates everything." When asked the same question, Regner will concur: "I hate it here. Came here with Edla. All these snooty Southerners. And damn guards won't let anyone have any fun." He will also mention that Edla wears the pants: "I'm Regner. You want anything? Talk to Edla. She's in charge." The gossiping townsfolk will often discuss Edla’s checkered past: "Rumor has it that Edla Dark-Heart left Skyrim with the law right behind her." and "I've heard Edla Dark-Heart was once an assassin!" Others will simply ask: "Do you know anything about Edla Dark-Heart's past?" and "Have you heard the rumors about why Edla Dark-Heart left Skyrim?" and receive one of the following responses: "I've heard a number of stories, none of them good. I understand she might have been a hired assassin." and "Apparently, she was wanted in Skyrim for murder. Shot a man dead from over 300 yards. Hard to believe." Edla may attack horses, including the player's horse, as an unintended side effect of her AI for retrieving arrows after her target practice. If a horse has been shot with an arrow, it goes into the horse's inventory and her AI will try to retrieve it from there by killing the horse. She won't attack the player or NPCs for arrows as her Responsibility statistic is too high to allow that. Esta página foi modificada pela última vez à(s) 23h47min de 26 de novembro de 2015.